I’m always going on about how delicious the cupcakes are at Sugar + Sunshine bakery in Plainsboro. On the left is one with dried cranberries, a smattering of white chocolate chips, and maybe walnuts. This was maybe my favorite one. 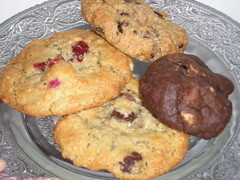 Moving clockwise, you see their exceptional oatmeal raisin, slightly chewy, then their all-chocolate wonder (maybe triple chocolate, cocoa, dark and white? ), and then traditional chocolate chip at six o’clock. Heck, I can’t exactly remember what was in each one, but I’m still dreaming of them! Have you tried their honey buns yet? Amazing. Thanks for the tip – another reason to return!